Detroit Red Wings goalie Jimmy Howard is introduced as a member of the U.S. Olympic hockey team Wednesday. ANN ARBOR, Mich. — What’s wrong with Jimmy Howard this season? According to Detroit’s goaltending coach, Jim Bedard, nothing. "This whole thing about Jimmy having a rough year, obviously, you’re judged by wins and losses," a somewhat irritated Bedard said on Wednesday. "But for the first 20 games, I thought he played very well, and a lot of those night’s he didn’t win. "Whether we didn’t get scoring or we had breakdowns or there wasn’t a save made, it is what it is. But I don’t think it’s poor play. I see him every day." Bedard is a bit defensive these days about his No. 1 goalie because every time he’s asked about Howard, it’s the same question about him being mired in a season-long slump. In the Winter Classic at Michigan Stadium on Wednesday, Howard came up on the short end of a 3-2 loss to the Toronto Maple Leafs, allowing two goals in a shootout. It was Howard’s second game back from a knee injury, and he looked much sharper than he did against the Nashville Predators on Monday. Still, it was another shootout loss. "Look at his body of work over that last four and a half years," Bedard said. "It isn’t like he’s been on a roller coaster. When things started to go a little bit down, it was because he was trying too hard. "When you lose in a shootout, it’s a one-shot game. The tide will turn. He works too hard, and the guys on this team know he’s our guy. It’s pretty senseless to try and start digging somebody’s grave when it’s not necessary." There’s something that’s been on Howard’s mind all season — making the U.S. Olympic hockey team. He’s obsessed with it. Now he can breathe a little easier. The selections were announced after Wednesday’s game, and Howard’s on the team. Bedard admits that with the Olympics hanging over Howard’s head, he might have been pressing a bit too much. "It’s highly possible," Bedard acknowledged. "Pressure is a funny thing,. You can’t see it, you can’t cut a knife or fork into it, but it’s there and it can make diamonds or it can make charcoal. "I thought that he might be pressing at times, but his work ethic never changes day to day to day." After Wednesday’s loss, Howard was introduced in his Tean USA jersey along with one of his Olympic teammates, Toronto’s James van Riemsdyk. As Howard entered the media center, you could tell that he was all business. "This is surreal," Howard said. He also talked about being in Ann Arbor on Sept. 11, 2001, playing for the USA Hockey’s National Team Development Program and how that team rallied around 9-11, especially during international tournaments. Playing for his country is multilayered for Howard. At 29 years old, he thought he had one shot at the Olympics — Sochi 2014. As much as he tried to put the Olympics on the back burner, it was always on his mind. When you’ve worn the colors, you always want to wear them again. "It’s a tremendous honor," said Howard about being an Olympian. "Every single time you get to wear the USA sweater, it’s such a tremendous honor, and the respect that comes with it is second to none." Howard’s coach, Mike Babcock, believes the honor of finally being an Olympian will let Howard refocus on the Red Wings. "Now that he’s been named to the Olympic team, just breathe and get on with being who he is and play," Babcock said. Many of Howard’s teammates were happy that he made Team USA. Captain Henrik Zetterberg went up to Howard shook his hand and gave him a hug while he was still in his Olympic jersey. "He played unreal for us (in the Winter Classic)," Zetterberg said. "He kept us in the game. Many times, he made some really nice saves. "I think he deserves to go to the Olympics. He’s working hard, and it’s going to be a fun experience for him." 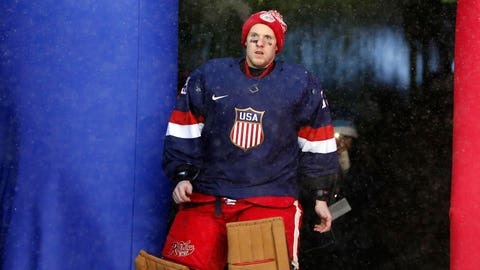 The Red Wings might not have won a hockey game Wednesday, but they did gain an Olympic goalie. That could very well turn around things for Howard — and for the Red Wings’ season.